SmartCentric and Siemens will be installing a multi-application contact/contactless smart card system at the largest independent college in the southeastern U.S. The new card will include identification, e-ticketing, physical and logical access controls (utilizing biometrics) and cashless purchases. Subsequent phases will incorporate transportation and car parking. Dublin, Ireland and West Palm Beach, Fla.–Nova Southeastern University (NSU) has chosen SmartCentric Technologies and Siemens Communications Inc. to create a one card solution for all their campus card needs. NSU is the largest independent institution of higher education in the Southeastern United States. In a unique partnership announced today, NSU will provide their students, faculty, staff, and community patrons with theSmartCity multi-application smart card solution and the Siemens HiPath SIcurity family of solutions. The SmartCity system, installed in over 90 sites worldwide with over 5 million cards issued, gives NSU the widest range of applications operating today on “One Card.” Utilizing both contact and contactless technologies, Phase 1 applications will include student, faculty, and staff ID cards, cashless purchases at POS, vending machines, Pay for Print, meal plans; a web-based card re-value and cardholder portal, and access control. The access control portion incorporates both physical and logical applications using biometrics. Immediately following Phase 1 deployment, NSU will implement eTicketing, which will allow NSU cardholders to pay for event tickets over the Internet and load the ticket to their NSU card, making entry to NSU’s University Center (grand opening in August 2006) paperless, quick, simple, and secure. 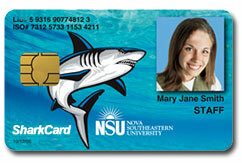 In subsequent phases, NSU will continue to add applications for both on and off-campus use. Solutions include Off-Campus Merchant programs, parking, transportation, and card based Digital Certificates at the university’s Health Care Centers. For further information, visit www.smartcentric.com. SmartCentric Technologies International is a specialist technology company focused on secure payments and transactions and multi-application smart card systems. SmartCentric’s flagship product, SmartCity, was originally developed by the SmartCentric team in the early 1990’s and has evolved into a trusted worldwide card solution. SmartCity is a Multi-Application Smart Card based system which has many wide-ranging uses, such as stored value, loyalty, gift cards, logical access, physical access, biometrics, car parking and ticketing. SmartCity is based on international standards and is teamed with best of breed industry partners to deliver leading edge technology and first class client friendly solutions. SmartCity has been used in over 90 sites worldwide with over 5 million cards issued in diverse sites such as colleges, government offices, military establishments, banks, cities, towns, shopping areas, and stadiums. Siemens AG is one of the largest global electronics and engineering companies with reported worldwide sales of $96 billion in fiscal 2005. Founded nearly 160 years ago, the company is a leader in the areas Medical, Power, Automation and Control, Transportation, Information and Communications, Lighting, Building Technologies, Water Technologies and Services and Home Appliances. With its U.S. corporate headquarters in New York City, Siemens in the USA has sales of $18.8 billion and employs approximately 70,000 people throughout all 50 states and Puerto Rico. Thirteen of Siemens’ worldwide businesses are based in the United States. With its global headquarters in Munich, Siemens AG and its subsidiaries employ 460,000 people in 190 countries. For more information on Siemens in the United States: www.usa.siemens.com. Nova Southeastern University, with its main campus in Fort Lauderdale-Davie, Florida, and student educational centers in Tampa, Orlando, Miami, West Palm Beach, and Jacksonville, Florida, and Las Vegas, Nevada, is the largest independent, not-for-profit institution of higher education in the Southeast, and the 7th largest nationally. It awards bachelor’s, master’s, educational specialist, doctoral, and first-professional degrees in a wide range of fields, including business, psychology, counseling, computer and information sciences, education, medicine, dentistry, pharmacy, optometry, nursing, law, marine sciences, and other social sciences. For more information visit www.nsu.nova.edu.